On Saturday, a writer for the Phoenix New Times took exception with Governor Doug Ducey’s characterization of #Redfored leaders as “political operatives.” Conservative talker Mike Broomhead and others who dared question #Redfored leaders Noah Karvelis and Derek Harris were accused of running a smear campaign by New Times writer Joseph Flaherty. “I feel they certainly represented my views very well,” Harris told Flaherty referring to the KFYI and Beacon stories. 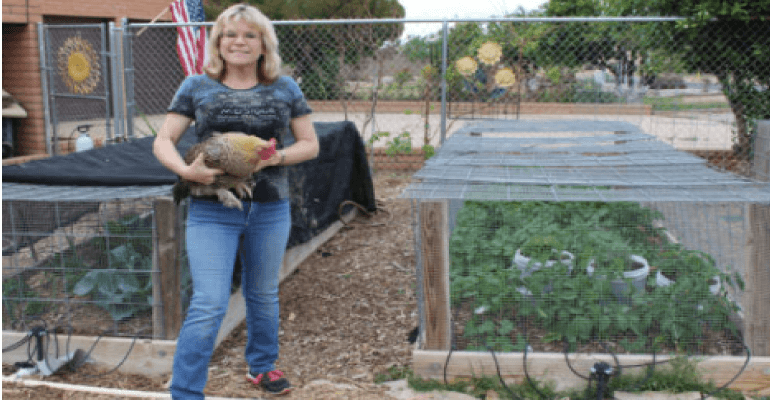 “Harris argued that none of his Facebook posts had anything to do with the current fight over education in Arizona,” reported Flaherty. Harris’ lack of self-awareness; the understanding that his political perspective does drive his, and many activists’ actions is a discussion for another day. Of course, “Who showed up”, the whole thing is a dog and pony show that forefronts politics while putting kids, achievement and learning on the back burner! …. The majority of the speakers… Becerra is also an aide to Congressman Grijalva, the illustrious father of the previous Board president. Also not noted is the number of people who throw accusations at Stegeman and Sedgwick and heckle throughout the meetings that have deep connections to the local Democratic power structure: think Adam Ragan and Derek Harris, an OMA (Opening Minds through the Arts) teacher. 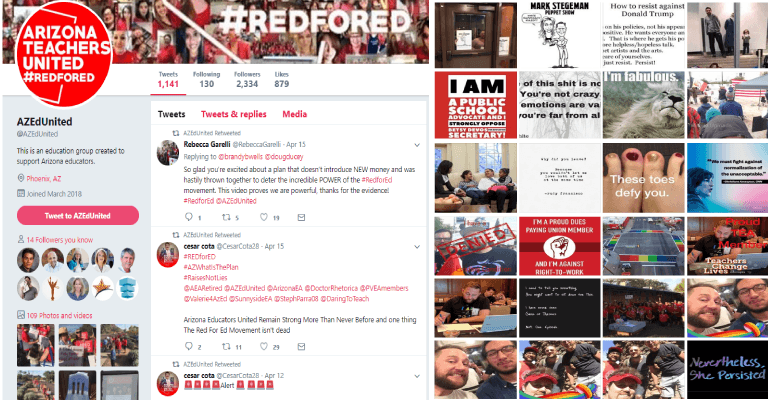 Arizona Teachers United Twitter page gained followers quickly. | Derek Harris Facebook page clearly shows political leanings. It should be noted that OMA, has for years, served as a vehicle for Tucson Unified School District leadership to grant Grijalva’s political operatives low impact jobs that allow time for electioneering and other political activity. Because proponents of Critical Pedagogy believe the classroom is little more than a activist incubator, it is hard to imagine that Karvelis would shy away from being described as a political operative. Despite conservatives’ belief that every public school classroom is an incubator for radicals, a good number of teachers value our current system of government and keep their politics to themselves while in school. It would be naive to think that one’s political point of view does not influence a teacher’s classroom behavior. However, most experienced and highly effective teachers allow students to freely express their opinions while keeping their own where it belongs; outside the classroom. Whether Harris and Karvelis are highly effective teachers is for their students to demonstrate, but as another KFYI talk show host, and former classroom teacher, James T. Harris tweeted, it is very clear that both lack experience in Arizona classrooms, and are therefore less-than-ideal-representatives of Arizona’s teachers. Lacking institutional knowledge, the two could have hardly taken a seat at Ducey’s negotiating table in any credible way had they been invited. Deficiencies – A Certification requirement which must be completed within a specified timeframe. Provisional Arts Education, PreK-12 Music AZCON Arizona Constitution Completion of a course or passing the appropriate examination on the provisions and principles of the Arizona Constitution is required. Provisional Arts Education, PreK-12 Music USCON United States Constitution Completion of a course or passing the appropriate examination on the provisions and principles of the United States Constitution is required. Derek Harris only became a certified teacher in January 2018 in Arizona. Occupation Annual mean wage in Arizona Annual mean wage in U.S.
Over the last five years, thousands of teachers have left the state, according to a 2015 report by the Arizona Department of Education, with this past school year being possibly the worst. The report warns if teachers keep leaving, “students will not meet their full potential” and “Arizona will not be able to ensure economic prosperity for its citizens and create the workforce of tomorrow.” It calls for increased pay for teachers and more overall education funding in the state. Why are so many teachers leaving? Educators say reasons include low pay, insufficient classroom resources, and so many testing requirements and teaching guidelines that they feel they have no flexibility and too little authentic instructional time. Unfortunately, Arizona taxpayers and politicians struggle with at least three issues. Do inexperienced teachers really deserve raises that will bust the State’s budget? How much of an increase in taxes can residents bear? How can you attract experienced teachers without increasing salaries? Karvelis and Harris lead-up Arizona Teachers United. The group bought their website’s URL on March 14, 2018. 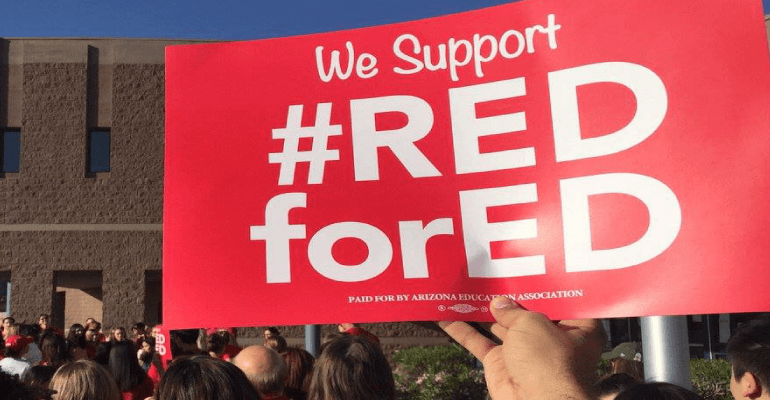 Arizona Teachers United has been responsible for pushing the well-established Arizona Education Association (AEA) to call for a strike. Last week, they were successful, and a walkout is planned for this coming Thursday. Apolitical, non-union, and conservative teachers have expressed concern about the decision, but according to sources, they had little say in the matter. But because not all teachers are on board with the walkout, some districts will keep their doors open. The truth is that Arizona spends approximately $9000 per pupil. In small districts and those under civil rights orders pay considerably more per pupil. Superintendent of Public Instruction Diane Douglas, who has consistently called for an increase in teacher pay, asked teachers to think hard before deciding to walkout. Douglas has implored teachers not to walk out of their classrooms if their salary demands are not met by that time. “I have long been a vocal proponent of providing teachers with significant pay raises,” Douglas said in a press release. “No one has more respect for the jobs that teachers do, which is why I proposed a viable, meaningful increase in their salaries last year, as well as sustainable funding specifically for them and school facilities. Hill told Harris that she left the AEA after her first year of teaching. She is not alone. Because AEA has failed miserably to represent teachers in the state for years, fewer and fewer teachers belong to the organization. This is not strictly an Arizona phenomena. In fact, across the country, as teachers’ associations took on political fights that had nothing to do with teaching and everything to do with progressive issues like climate change, membership has fallen off. Many things have contributed to that fact that Arizona teachers’ pay is one of the lowest in the country. Three factors have most impacted teacher pay: 1) Arizona’s cost of living is low; 2) AEA and various local unions have been occupied with partisan political battles rather than the needs of teachers; and 3) the state has little taxable property with which schools are funded. It is because of those three factors, that educational leaders must force a genuine conversation about teacher pay and not a knee jerk reaction like the governor’s budget-busting proposal. Townsend’s demands are clear and reasonable to say the least. Should educators and the governor reject them, their motives are too clear and their positions are unreasonable. Loretta Hunnicutt, We DON’T have a funding problem, we HAVE a SPENDING problem in Public Education. For which you and the ADI refuse to delve into. TUSD, $250,000 per classroom per year and they still can’t get the job done. We have a progressive marxist problem. One thing for sure, Noah Karvelis and Derek Harris have certainly made lots of money by selling pretty shirts to teachers. Ducey is just now interested in education, what a load of crap! The Republican lead Legislature has for his entire years as Governor focus on prisons ( makes a profit ya know ) over education. It more than time to eliminate Republicans I’m Legislature who forgot they serve the public. Yes teachers have earned more pay. Yes our kiddos DESERVE the best we can give them. Support teachers , let’s get new Governor understands education first. Not politics. Richard, aren’t taxpayers part of “the public” too? I’d paint a message on my car (in an obvious color) saying “Green for Taxpayers”, but it would likely be vandalized in a day. The Dynamic Duo do not need Teachers Certification in order to indoctrinate. Ignore them Governor. They are paid progressive protesters. I just got a question that I want to ask. Do you suppose that the teachers are wearing their pretty red T shirts to class? And if so, why is the administration allowing them to do so? The teachers by wearing the shirts in the classroom are simply pushing the students in a political direction and not an educational direction. I call BS on the teachers the teachers that are wearing the T shirts in class. They should be dressed as a professional and not a hippie in a red T shirt being a political billboard. The other question is why are the teachers cars allowed on school property with the slogan painted on the glass. Once again, they demonstrate that their only regard is for themselves and not the students. But hey, its all about indoctrination now right? And the parents and administrators let them get away with it. What the teachers want to do on their own time is fine, but dress like a professional and leave the crap off your cars when you get to school property. Hope that they go down in flames. Once again, its all about the adults and not the kids. Hey all you redfored clowns, might want to ask you local boards and administrators what they are going to do with the extra state money? I know you dumb asses won’t get much of it. Your last comment is certainly accurate. Historically, local administrators have misused the funds leaving teachers for last. However, I must disagree with a couple of issues you brought up. First, you are under the impression that we are meekly following these unqualified leaders. The truth is that the great masses of teachers supporting the movement are actually the force behind Redfored which is in fact completely apolitical. Our main concern is to improve the state of education. We teachers are the keystone of the system and we are demanding only what is ours. Yes, our top priority is better salaries and the demands placed by our teachers if fulfilled will indeed benefit our students directly. Second point you mentioned is that teachers should focus on teaching rather than “indoctrinating” and doing “hippie” stands during school hours. Again, you are under the false impression that we enjoy our current position. It took us 10 years to make a decision to take action because no one else would. We should all be ashamed for allowing such decline in our schools and forcing teachers to take action. As a citizen and contributing taxpayer, I am also concerned about the ineptitude and narrow mindedness of our government. For the last 10 years we have seen that their fiscal decisions have drove an exodus of teachers out of the state. While I support any viable solution that will boost our schools and therefore the well being of the state, I do not believe the answer lies on placing all the financial burden on teachers. Again, I say this without having any political affiliations or personal greed. It is just the truth. We can all agree on the fact that well educated children are shaped at home and supported at school by well prepared teachers. However, we have a very difficult time understanding that we need to make a higher investment on education if we want to see positive changes. If on the other hand, we cannot agree on the value of education, then we must at least lower the standards for teachers. Yes, make high school diploma and 1 year of technical training the requirements for certification. Then, these new breed of teachers will not have an issue living just above the poverty level. Also, do not expect them to maintain a highly qualified status and/or show great dedication and responsibility in the job. You see, they will be merely employees but not professional educators. In fact, why chose education when you can make the same money taking the blood pressure and weight of patients at the doctor’s office. Stop the double standard. Lets’ put our money when our mouth is. I want to go back to work and be able to focus on my professional duties. Governor Ducey needs to create a sustainable budget directed to salary increment. That is his job and should not be my concern. jdfast – you are 100% correct! Sad, and they wonder why people are pulling their children out of those schools, and putting them in Charter Schools and Private Schools. My wife & I put 4 children though TUSD. The kids where hers, mine and ours and where all seven years apart. So, 28 years of school aged children exposed us and them to the decline of quality education in the TUSD district. One of our Grand children is in TUSD currently. Last year while in Middle school he never had a Biology teacher therefore the substitutes never actually taught biology; now in High School he is having a hard time will Biology. And that is the problem with Arizona being ranked 49 out of 50 with quality education. The teachers we get here might be the bottom of the crop that where turned away by the other 48 better paying states. Where you place in class upon graduation is important; ask your Doctor where he or she place in Medical School. Top 10% is better than the Bottom 10%. As I see it the teachers should be paid by merit for quality education. The best place to thin the herd is with the administration “fat cats” that are paid way to much for what they do. The kids are our future and the system has failed them. Moderation for the truth? Thanks thought police! What I would like to know is, IS this a real strike or just a couple days of noise? Seems NO ONE knows, teachers, aids etc, tusd finally joined in and closed down for friday but again no one knows what monday will bring. Has there been any ‘news’ talk on this being a real strike or is it just noise? Let me tell you if anyone thinks the whole of AZ is down with this THEY ARE NOT. Charter schools will be over loaded and these strikers will wonder if it was worth it. We need a NO NOAH campaign start the memes and let’s dig deep to expose this liberal nonsense. This is a war on parents and you liberal plants ain’t winning!!! The underlying issue is this this traveling promotion of chaos and Marxism/Communism designed to oust sitting Republican Governors only and replace them with Democrat Communists….another political tactic by Democrat Communists to gain control of all states on a local level to create the Jerry Brown/Cuomo/Deblasio effect. The goal is to overthrow our government by defiance of Federal Law. Kevalis even messaged one of his cohorts about this method of overthrow. He and they are very proud of themselves for manipulating the rift between teachers and states. They target and exacerbate ANY type of dissection within a community or state, expound on it/manipulate those involved in it and attempt to use that to overthrow Republican offices. Thus the question of their ” provisional teaching certifications” and jumping from state to state creating chaos and disruption. Essentially, they are “hired guns” to eliminate/decimate any vestige of the Constitutional Republic/Democracy. Emphasis on motives of Noah Karvalis and Derek Harris is a red herring. Yes, I have been guilty of complaining to students of conditions or underlying causes of changes in this country since I was in high school in the 1970’s. We teachers are employed to teach, not to politic or campaign in the classroom. Such political views or “indoctrination” is unprofessional and at some point becomes contrary to vocation. But our critics do not give our students enough credit either. Our students are very much in tune with political and economic issues and must make attributions to our motives. Admittedly, I teach high school, the very young students are more naive. I also agree that our union has lost members with premature and unconsulted endorsements, and staking political positions far outside of the very narrow confines of professional practice. Some of these positions in the past included lowering the voting age to 18 and promoting desegregation of the schools. Our critics should also know that teachers far and away are middle-of-the-road, working people who buy property and raise children, and pay bills. I support the proposals for transparency, both in traditional public and charter schools, which have been given a very different set of rules under which to operate. Yes, indeed, there are spending issues but districts realize adequate salary is needed to attract and retain quality staff, and my district certainly acts like it. Finally, many of our critics come across as disingenuous when raising distracting red herring issues. New spending is not demanded, but restoration of spending at a level before the recession. If not, as others have stated, we professionals can certainly seek greener pastures. This will finally come down what choice the people of Arizona will make for the future of our state. Yes, Loretta, I did state those things about Derek Harris during a particularly nasty political campaign, and while the District was getting rid of its last Superintendent, who I firmly believe is and was a petty criminal in many ways. However, I do want to stress that I do not feel that one would have to be in the Grijalva camp to believe that teachers get treated like caca in this state! It is unassailable, as it is unassailable that there are plenty of Republican teachers in Phoenix striking alongside their political opponents. In my experience, teachers, in general, are not very political/partisan in the sense that you and your readers are referring to here. They focus their energies on trying to educate your children and mine, and dealing with you and me as parents. As a parent and a public education advocate, I am incredibly grateful to them for putting themselves on the line to change the pathetic state of education funding in our state. Why should Arizona be number 50? Why should we be a state that only retirees want to live in, as educating your kids here is almost untenable? Why in the world would any state put a cement block on its ankle, even as it expects high paying jobs to come here? What is the first thing that employers and employees ask? “How are the schools” (Its a little hard to believe that that is not a factor in our slow increase in well paying jobs) I am outraged by those who might as well be saying that I and the rest of us who have kids and believe in public schools should move to New Jersey where the funding is good. Arizona simply has to better than this–and the teachers are out there fighting for all of us. If I can put aside political differences to converse about public education with pro-public ed Republicans who are very far from my position on many other things, I expect them to do the same…and some of them have! I have found that it works and your readers might give it a try as well. Our kids deserve it, frankly. While we are all hissing and spitting at each other, their future is looming, and our disfunction on these issues helps no one. One only has to look at the TUSD Board to see this behavior; for GODS sake lets not reproduce it in the rest of the public sphere.